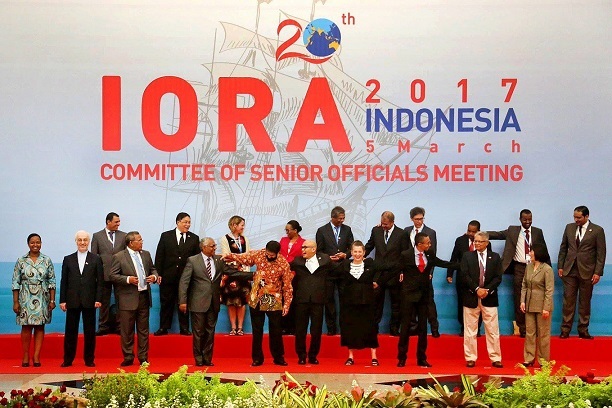 Indonesia is hosting the 20th Indian Ocean Rim Association (IORA) summit 2017. About 100 people, including representatives from the 21 IORA member countries that border the Indian Ocean are attending the meeting. The IORA Summit is an international event that convenes coastal states bordering the Indian Ocean. Vice President Hamid Ansari is representing India at IORA Summit. The Swedish passport has been rated the world's most valuable by consulting firm Nomad Capitalist. The Indian passport was ranked 160th, while Afghanistan's and Pakistan's passports were among the least valuable. INS Viraat, which holds a Guinness world record for being the oldest surviving aircraft carrier in the world, retired from service today. INS Viraat was first commissioned in the Indian Navy on May 12, 1987, after the Indian government bought it for ₹433 crore. Before 1987, the aircraft carrier had served the United Kingdom's Royal Navy for 27 years. Indigenously-manufactured INSAS rifles will 'retire' from the army after 20 years in service and be replaced by an imported rifle. The Indian Small Arms System (INSAS) is likely to be replaced with deadlier assault rifles of a higher caliber. Note : INSAS rifles were being retired due to their limited effectiveness at long range. Jammu and Kashmir Minister for Food, Civil Supplies, and Consumer Affairs Chowdhary Zulfkar Ali today inaugurated the 1st smart tribal model village 'Hubbi' in Rajouri district of the state. Developed under the rural development department, the village has been introduced with smart classes in the schools, better roads, electricity, and water facility. Noida will get its 1st Bike Taxi service later this month with the launch of "Baxi". Note : Baxi already runs its services in Gurugram. India's tallest national flag, measuring 360 feet, was hoisted today at the Attari-Wagah joint check post in Punjab. The flag, built at a cost of ₹3.6 crore, can be seen from Lahore in Pakistan. Note : A 293-foot tall tricolour in Ranchi had held the record earlier. The Union Government has launched the 1st ever across-the-river survey in River Ganga to determine the population of aquatic life, including that of the endangered Gangetic doplhin. The survey will create a baseline scientific data for the government to take suitable measures to improve quality of the Ganga’s water. Haryana Government has announced Tirtha Darshan Scheme under which senior citizens above 60 years of age in the state will be able to go on a pilgrimage within the country at government expense. North Korea fired four ballistic missiles into the sea off Japan's northwest coast early today. Three of the missiles covered nearly 1,000 km and landed in waters as close as 300 km to Japan's coastline. This comes as South Korea and the US hold joint military exercises, which North Korea views as preparations for an invasion. The State Bank of India (SBI) has recently announced that it will start charging its account holders a penalty if they fail to maintain a minimum balance in their savings account. According to the new rules effective from April 1, it is mandatory for accounts to maintain a balance of Rs 5,000 in metropolitan areas, Rs 3,000 in urban areas, Rs 2,000 in semi-urban areas and Rs 1,000 in rural areas. Kerala Finance Minister Thomas Isaac has recently presented the State Budget for fiscal year 2017-18. Allotted 900 crore for ration subsidy. Announced an increase of Rs 2000 in the pension amount of Pravasi from Rs 500 to 2000. Alloctated Rs 3000 crore for revival of Kerala State Road Transport Corporation (KSRTC). Giving high priority to protection of women in the state, Rs 5 crore was assigned for protection and rehabilitation of women. Allocated 2100 crore for Agriculture sector. Set aside Rs 248 crores for Anganwadis. Onelakh houses for homeless in next year. Allocated 100 crore for smart cities. Rs 10 crore was announced to end manual scavenging and plant 3 crore tree saplings by next monsoon. Rs 10 crore was set apart as compensation for Endosulphan victims. Rs 1000 crore for optic fiber network through K-phone 6500 cr for development of coastal roads. Rs 174 crore for electrification of all houses in the state. Rs 25 crores-Sabarimala Master Plan. Rs 25000 crore was set apart for infrastructure development in the state. Rs 2600 crore for upliftment of SC and 750 crore for ST 128 crore for coir industry. American physician and researcher Thomas Starzl (90), who performed the world's first human liver transplant in 1963, passed away. He also performed world's first successful liver transplant in 1967. Starzl, often referred to as "the father of modern transplantation", also performed the world's first simultaneous heart and liver transplant in 1984.